Easy step by step tutorial of how to paint laminated furniture in no time! Can I paint laminated plywood? Yes you can my dear! I am sure you have seen a bunch of laminated furniture in your Thrift Stores. You may have loved the clean lines of it or the pretty shape, but you have been turned off by the ugly plastic brown look of it. 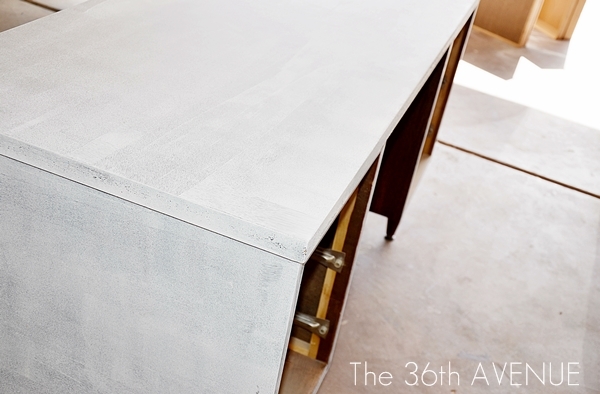 I am going to show today how you can give a fake wood a nice strong finish in just a few steps. I can’t emphasize enough how important it is to prepare the surface you are going to paint. The fact of the matter is that a clean surface is the most important step for a clean finish. Pull out your drawers and hardware. Get your soap, warm water, a good sponge and clean away! When your surface is thoroughly clean and dry it is time to prime. I like to use a small sponge roller and a soft small brush for this type of surface. After your entire piece of furniture is primed LET IT DRY perfectly. The trick of priming is time, it needs to cure in order to hold to the surface you are working on. Read the directions, follow the directions, be patient and wait. After your primer has cured it is time to paint. Do as many coats as you feel are needed giving each coat enough time to dry. 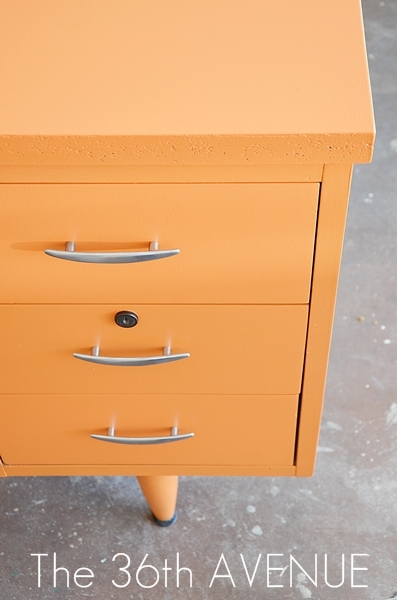 you may take away some of that fresh paint out making your furniture look sad. You want your new piece to look pretty! Don’t be afraid to use bright colorful accent pieces in your home. 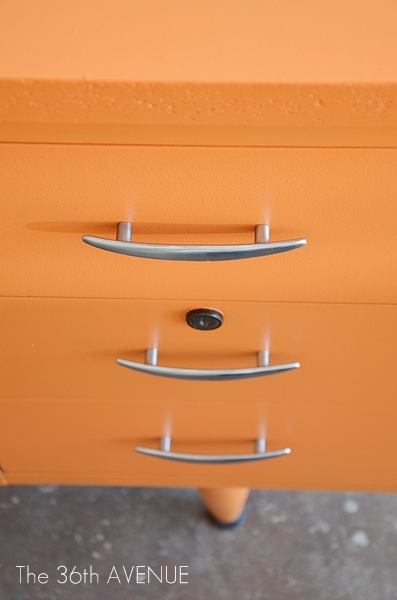 My friend Dave chose a true orange as one of the accent colors for his man cave. How fun is this? It looks great even at night! 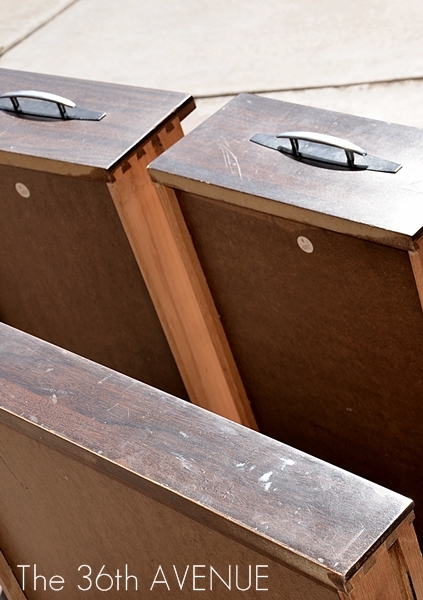 So if you have some old laminated plywood that needs help don’t be afraid to give it some love. Remember, clean it, prime it and paint it. my decorate with FURNITURE on Pinterest. If you are new to my blog I want to welcome you! I hope you stay in touch and Subscribe to The 36th Avenue via Readers. 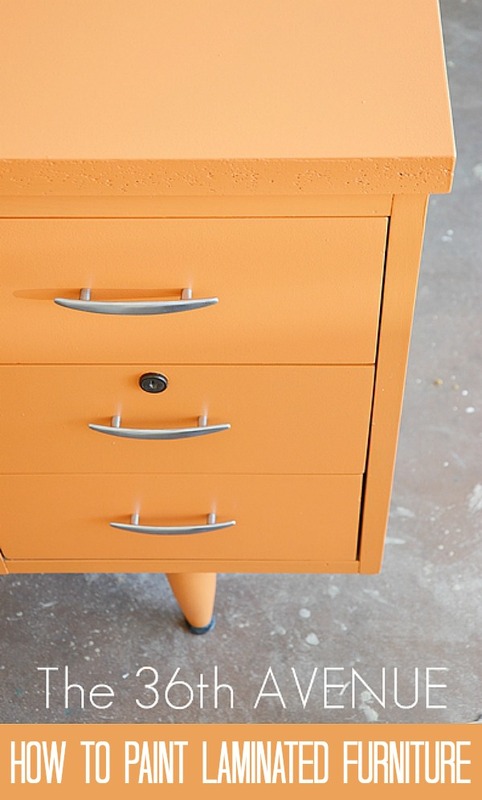 Hi Desiree, do you have a favorite primer and paint that you prefer for working with laminate furniture? I love to use Olympic One for the paint. You can find it at Lowes. The most important thing when you use a primer is that you really let it cure. I don’t have a favorite primer but follow the direction about how long you need to wait before you add a new coat of paint. That will determine how well the primer will work. Kitchen cabinets are tricky since they get a ton of use. I would recommend to talk to a professional about it before painting them. Hello! 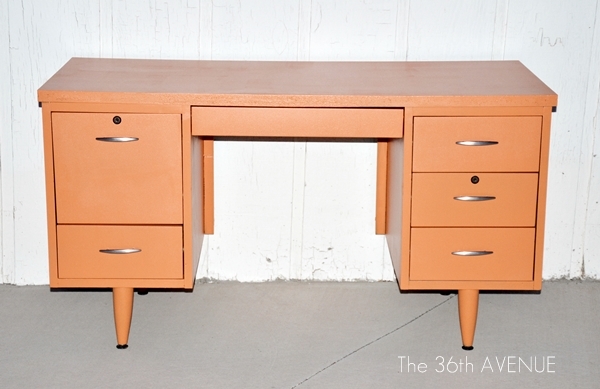 I featured your desk in the Pastels edition of my blog series, Get Your Color On! 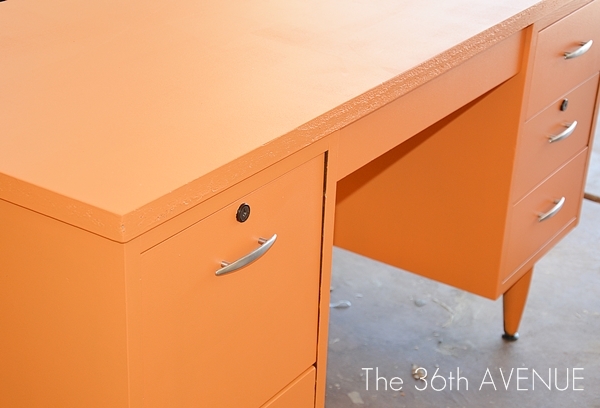 It’s the perfect shade of orange, especially for spring. I have a similar desk I painted in teal—love the style!